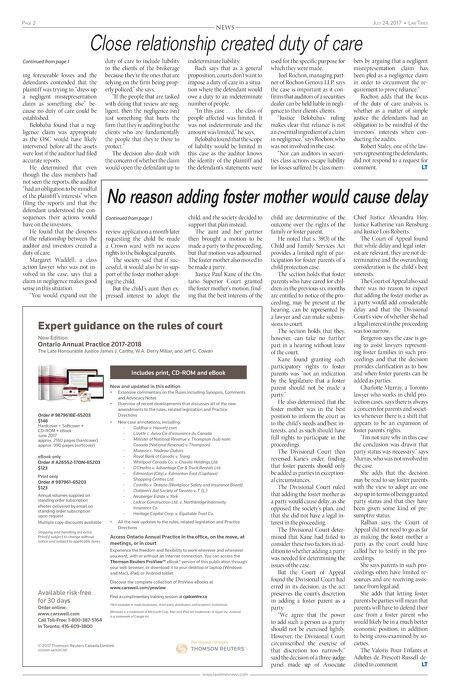 Page 2 July 24, 2017 • law Times www.lawtimesnews.com NEWS review application a month later requesting the child be made a Crown ward with no access rights to the biological parents. The society said that if suc- cessful, it would also be in sup- port of the foster mother adopt- ing the child. But the child's aunt then ex- pressed interest to adopt the child, and the society decided to support that plan instead. The aunt and her partner then brought a motion to be made a party to the proceeding, but that motion was adjourned. The foster mother also moved to be made a party. Justice Paul Kane of the On- tario Superior Court granted the foster mother's motion, find- ing that the best interests of the child are determinative of the outcome over the rights of the family or foster parent. 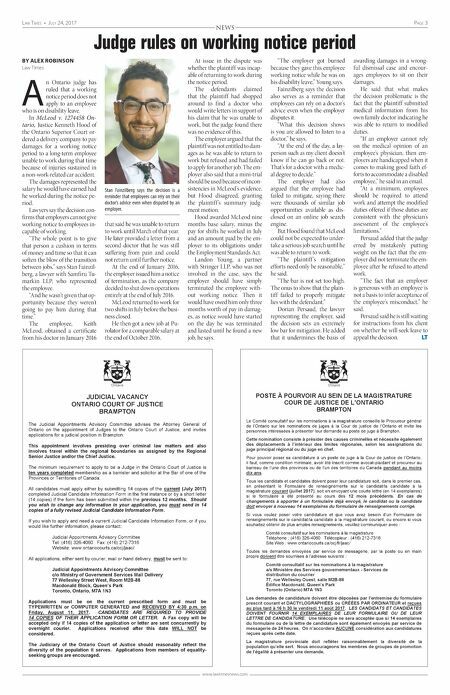 He noted that s. 39(3) of the Child and Family Services Act provides a limited right of par- ticipation for foster parents of a child protection case. The section holds that foster parents who have cared for chil- dren in the previous six months are entitled to notice of the pro- ceeding, may be present at the hearing, can be represented by a lawyer and can make submis- sions to court. The section holds that they, however, can take no further part in a hearing without leave of the court. Kane found granting such participatory rights to foster parents was "not an indication by the legislature that a foster parent should not be made a party." He also determined that the foster mother was in the best position to inform the court as to the child's needs and best in- terests, and as such should have full rights to participate in the proceedings. The Divisional Court then reversed Kane's order, finding that foster parents should only be added as parties in exception- al circumstances. The Divisional Court ruled that adding the foster mother as a party would cause delay, as she opposed the society's plan, and that she did not have a legal in- terest in the proceeding. The Divisional Court deter- mined that Kane had failed to consider these two factors in ad- dition to whether adding a party was needed for determining the issues of the case. But the Court of Appeal found the Divisional Court had erred in its decision, as the act preserves the court's discretion in adding a foster parent as a party. "We agree that the power to add such a person as a party should not be exercised lightly. However, the Divisional Court circumscribed the exercise of that discretion too narrowly," said the decision of a three-judge panel made up of Associate Chief Justice Alexandra Hoy, Justice Katherine van Rensburg and Justice Lois Roberts. The Court of Appeal found that while delay and legal inter- est are relevant, they are not de- terminative and the overarching consideration is the child's best interests. The Court of Appeal also said there was no reason to expect that adding the foster mother as a party would add considerable delay and that the Divisional Court's view of whether she had a legal interest in the proceeding was too narrow. Bergeron says the case is go- ing to assist lawyers represent- ing foster families in such pro- ceedings and that the decision provides clarification as to how and when foster parents can be added as parties. Charlotte Murray, a Toronto lawyer who works in child pro- tection cases, says there is always a concern for parents and societ- ies whenever there is a shift that appears to be an expansion of foster parents' rights. "I'm not sure why in this case the conclusion was drawn that party status was necessary," says Murray, who was not involved in the case. She adds that the decision may be read to say foster parents with the view to adopt are one step up in terms of being granted party status and that they have been given some kind of pre- sumptive status. Ralhan says the Court of Appeal did not need to go as far as making the foster mother a party as the court could have called her to testify in the pro- ceedings. She says parents in such pro- ceedings often have limited re- sources and are receiving assis- tance from legal aid. She adds that letting foster parents be parties will mean that parents will have to defend their case from a foster parent who would likely be in a much better economic position, in addition to being cross-examined by so- cieties. The Valoris Pour Enfants et Adultes de Prescott-Russell de- clined to comment. LT ing foreseeable losses and the defendants contended that the plaintiff was trying to "dress up a negligent misrepresentation claim as something else" be- cause no duty of care could be established. Belobaba found that a neg- ligence claim was appropriate as the OSC would have likely intervened before all the assets were lost if the auditor had filed accurate reports. He determined that even though the class members had not seen the reports, the auditor "had an obligation to be mindful of the plaintiff 's interests" when filing the reports and that the defendant understood the con- sequences their actions would have on the investors. He found that the closeness of the relationship between the auditor and investors created a duty of care. Margaret Waddell, a class action lawyer who was not in- volved in the case, says that a claim in negligence makes good sense in this situation. "You would expand out the duty of care to include liability to the clients of the brokerage because they're the ones that are relying on the firm being prop- erly policed," she says. "If the people that are tasked with doing that review are neg- ligent, then the negligence isn't just something that hurts the firm that they're auditing but the clients who are fundamentally the people that they're there to protect." The decision also dealt with the concern of whether the claim would open the defendant up to indeterminate liability. Bach says that as a general proposition, courts don't want to impose a duty of care in a situa- tion where the defendant would owe a duty to an indeterminate number of people. "In this case . . . the class of people affected was limited. It was not indeterminate and the amount was limited," he says. Belobaba found that the scope of liability would be limited in this case as the auditor knows the identity of the plaintiff and the defendant's statements were used for the specific purpose for which they were made. Joel Rochon, managing part- ner of Rochon Genova LLP, says the case is important as it con- firms that auditors of a securities dealer can be held liable in negli- gence to their clients' clients. "Justice Belobaba's ruling makes clear that reliance is not an essential ingredient of a claim in negligence," says Rochon, who was not involved in the case. "Nor can auditors in securi- ties class actions escape liability for losses suffered by class mem- bers by arguing that a negligent misrepresentation claim has been pled as a negligence claim in order to circumvent the re- quirement to prove reliance." Rochon adds that the focus of the duty of care analysis is whether as a matter of simple justice the defendants had an obligation to be mindful of the investors' interests when con- ducting the audits. Robert Staley, one of the law- yers representing the defendants, did not respond to a request for comment. LT Continued from page 1 Close relationship created duty of care No reason adding foster mother would cause delay Continued from page 1 Expert guidance on the rules of court Available risk-free for 30 days Order online: www.carswell.com Call Toll-Free: 1-800-387-5164 In Toronto: 416-609-3800 New Edition Ontario Annual Practice 2017-2018 The Late Honourable Justice James J. Carthy, W.A. Derry Millar, and Jeff G. Cowan Order # 987961BE-65203 $148 Hardcover + Softcover + CD-ROM + eBook June 2017 approx. 2160 pages (hardcover) approx. 990 pages (softcover) eBook only Order # A26552-17ON-65203 $123 Print only Order # 987961-65203 $123 Annual volumes supplied on standing order subscription eNotes delivered by email on standing order subscription upon request Multiple copy discounts available Shipping and handling are extra. Price(s) subject to change without notice and subject to applicable taxes. Includes print, CD-ROM and eBook © 2017 Thomson Reuters Canada Limited 00245IP-A87606-NP New and updated in this edition • Extensive commentary on the Rules including Synopsis, Comments and Advocacy Notes • Overview of recent developments that discusses all of the new amendments to the rules, related legislation and Practice Directions • New case annotations, including: - Goldhar v. Haaretz.com - Lizotte c. Aviva Cie d'assurance du Canada - Minister of National Revenue v. Thompson (sub nom. Canada (National Revenue) v. Thompson) - Morasse c. Nadeau-Dubois - Royal Bank of Canada v. Trang - Whirlpool Canada Co. v. Chavila Holdings Ltd. - D'Onofrio v. Advantage Car & Truck Rentals Ltd. - Edmonton (City) v. Edmonton East (Capilano) Shopping Centres Ltd. - Castrillo v. Ontario (Workplace Safety and Insurance Board) - Children's Aid Society of Toronto v. T. (L.) - Neuberger Estate v. York - Ledcor Construction Ltd. v. Northbridge Indemnity Insurance Co. - Heritage Capital Corp. v. Equitable Trust Co. • All the new updates to the rules, related legislation and Practice Directions Access Ontario Annual Practice in the office, on the move, at meetings, or in court Experience the freedom and flexibility to work wherever and whenever you want, with or without an Internet connection. You can access the Thomson Reuters ProView™ eBook* version of this publication through your web browser, or download it to your desktop or laptop (Windows and Mac), iPad, or Android tablet. Discover the complete collection of ProView eBooks at www.carswell.com/proview Find a complimentary training session at cpdcentre.ca *Not available to trade bookstores, third-party distributors and academic institutions. Windows is a trademark of Microsoft Corp. Mac and iPad are trademarks of Apple Inc. Android is a trademark of Google Inc.